It comes after Liberal Public Safety Minister Ralph Goodale ordered new, tougher rules for prisoner transfers to Indigenous healing lodges, following weeks of protests organized by Stafford in Ottawa on Parliament Hill and Stafford’s hometown of Woodstock, Ont. Under the new policy Goodale announced today, transfers will have to be authorized by Correction Service of Canada’s (CSC) deputy commissioner for women, who will be required to ensure that Indigenous communities are engaged in transfer recommendations. Length of an offender’s sentence. Time remaining before an offender is eligible for an Unescorted Temporary Absence. A requirement that long term offenders be at least into the “preparation for release” phase of their correctional plan. Institutional behaviour, for those serving long sentences. Goodale’s spokesman Scott Bardsley said CSC will take steps to apply the new rules as quickly as possible, but did not say if McClintic has been transferred or will be transferred soon. CSC is not permitted to publicly disclose an inmate’s location, but relays transfer information to registered family members of victims, he said. Rodney Stafford has registered his name with CSC, but said he had not yet heard about whether the child killer has been transferred by correctional authorities. He noted the kind of anxiety he’s experiencing is akin to when he was in court, waiting for the verdict of his daughter’s other killer, Michael Rafferty. “It’s kind of gut wrenching,” he said. “You’re waiting for answers and it could come any time. You just don’t know when. It’s hard,” he said. He called today’s announcement “a start,” but said he won’t be satisfied until McClintic is back in a prison cell. Goodale ordered CSC to review the McClintic decision and the policy at large. He said the minister has no legal power to intervene in individual cases, and that decisions about correctional and security classifications are based on what is best for the offender’s rehabilitation and for public safety. Last month, the House of Commons defeated a Conservative motion calling on the government to condemn and overturn the decision to transfer McClintic to the healing lodge. 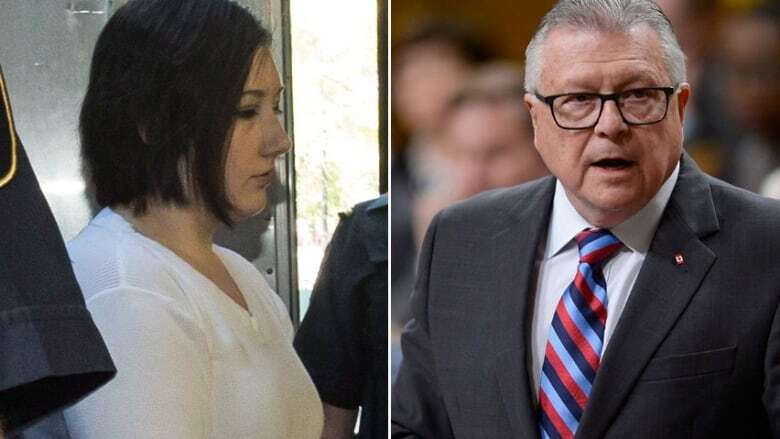 McClintic was convicted of first-degree murder in Tori Stafford’s death in 2010, two years before her former boyfriend Michael Rafferty was convicted of kidnapping, sexual assault and first-degree murder in connection with Tori’s death in a separate trial. Stafford was abducted on April 8, 2009, while walking home from her Woodstock, Ont. elementary school. McClintic lured the girl to Rafferty’s car before the pair drove her to a secluded location near Mount Forest, Ont. where she was brutally raped, beaten to death and then buried in a clandestine grave. Her disappearance sparked one of the largest searches for a missing person in Canada, as police officers in a number of nearby communities combed the countryside searching for any sign of eight-year-old.